With four bikes in the back of the van, and living space up front, there’s not much room for a bed. The only option is to mount it above the bikes using removable panels. We want to be able to sit up in bed, but we also want to be able to carry bikes with their wheels on, and some of our bikes are over 40″ tall floor-to-handlebar. We wanted a panel style bed, like the ones used by several of the upfitters (Outside Van, RB Components, etc.). We didn’t want to pay their prices though. Originally we intended to make our own, using wall-mounted L-angle brackets made from pulltruded fiberglass, and some repurposed 2″ thick polyiso foam-filled insulated commercial aluminum wall panels to be the bed base. However, Eric at OverlandSprinters.com saved us a bunch of hassle. He’s created a bed rail and panel kit that you can build up and install yourself, far cheaper than the other upfitter options. There’s more work involved with installing his kit, but by selling the bare aluminum frames and steel rails, he can cut down on shipping costs. His kit provides the pieces that would be hard to make without specialist equipment. The kit is really sturdy. The aluminum frames are welded well. The rearmost one (shown in the picture) has a cut-out so it fits into the rear door area. That saves some space in the rest of the van and it also means you don’t lose pillows, etc. down the back of the bed. The rails are 11 gauge steel. Before we received them, we were planning on adding sheet steel supports in each of the “window” areas that the rails will cross. However, I bet you could just bolt the rails at each end and they would be fine. In the end we bolted them at each end and at the central pillar. The beauty of this kit is that you get to choose exactly how and where you will make the attachment points. We drilled three holes at each end of the rails, and four in the middle. 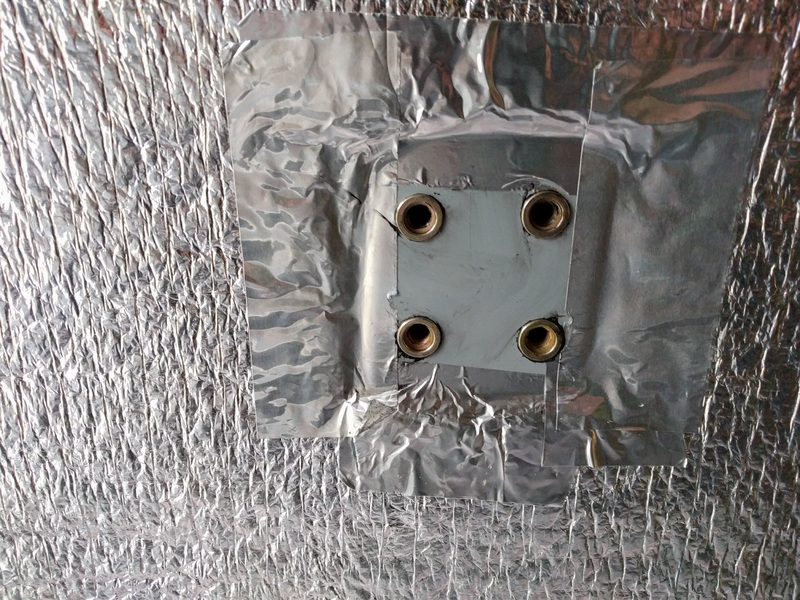 Each hole takes an M8 bolt, mounted to the wall using Rivnuts. The ones in the picture aren’t quite as squiffy as they look. The D pillar slopes inwards at that point. Here’s the upright between the D and C pillars (C-1/2?). This upright is between the two rear window blanks in a 170 van. It doesn’t exist in a 144. And here’s the holes in the C pillar. Lining the rivnut holes up through the wall panels was a pain. One isn’t quite where it needs to be so we’ll need to “relieve” the edge of the hole in the rail to make it fit. We used 1/2″ pre-finished maple faced plywood to form the deck for the panels. Because we wanted a full 80″ bed we extended the plywood beyond the aluminum frames, 1″ on each side for the rearmost panel and then 1-1/2″ on each side for the other two panels. The only annoyance with doing this was that we had to use two sheets of plywood, because the panels ended up more than 24″ wide. The middle panel is made from two half-width pieces. All the decks are bolted down to the frames using T-nuts and M6 bolts. We also put 1/16″ rubber matting on the underside of the panels where they contact the metal of the rails. This should cut down on rattles and also prevent the rails from getting so scratched. We painted the rails (Rustoleum semi-gloss black) but we’d be tempted to send them out for powder coating if we were doing this again. The powder coat would be much more durable. Clamping the panels down to the rail proved to be more of an issue than we expected. We drilled holes in the top of the rail to accept bolts that would then pass through the panels. 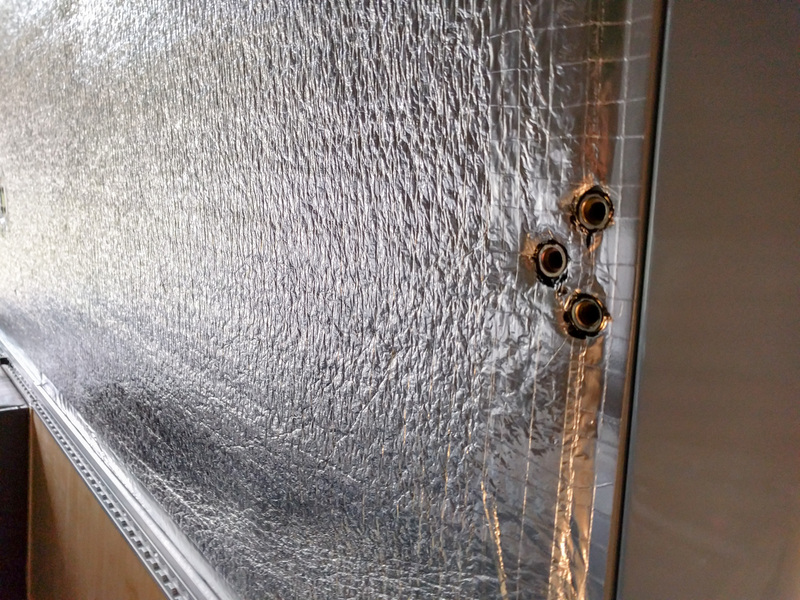 However, we did the measurements before we bolted the rails to the wall for the final install. The rails compressed the wall panels so much that now the holes are in the wrong place. In the end, we hunted around in our spare parts bins and found some “J” bolts with threaded knobs. After making little clamping plates for these and coating them in plasti-dip, we drilled holes into the aluminum frames and snugged them down. They work really well! Update: we drilled new holes for the J bolts in the crosspieces of the aluminum frame rather than in the side pieces. That makes it easier to clip the J bolts in place and they hold tight better now. Basically, think of the hole being the other side of the weld on the picture below. I’ve got to say a big thank you to Eric at overlandsprinters.com for creating this kit. 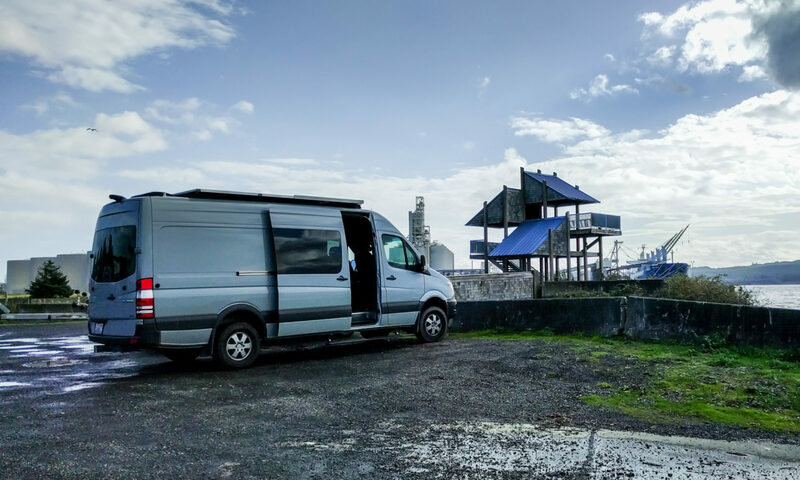 If you want a platform bed in your van, this is a great way to get all the benefits of the commercially available versions with the price of a DIY option. Update: The 80″ long bed overhung the passenger bench seat too much. We cut the deck wood down flush with the panels and ended up with a 73″ long bed, which gives us enough room to sit in the passenger bench seat without hurting our necks. Did you measure the amount of movement from the drilled holes to where the holes needed to be after adding the inner panels? The difference in location for the holes is probably 1/2″ (give or take) but that is largely due to the way my wall panels are constructed. If you were bolting these bed rails directly to the van metal or to wall panels with no compressible areas, you’d be just fine. Either way I think it’s best to drill the holes that hold the panels down after the bed rails are mounted to the wall. Great work! Is the bed sturdy without welding a steel support plate to the space spanning the pillars? Thanks so much for all the great insight into my future build. Van arrives August. Thanks! The bed is more sturdy than I ever imagined. There’s no need for a support plate. I even bought some stainless steel to use in that location but there was just no need. The steel rails are 11 gauge, which is strong enough to span the gap with no issues. I put three bolts through into the pillars at each end, and four in the middle. That was probably overkill. Two bolts at each location would have been sufficient. Have fun with your van when it turns up! Thank you for the answer. I don’t know how to weld so I have been trying to wrap my head around this problem. This is definitely the answer. 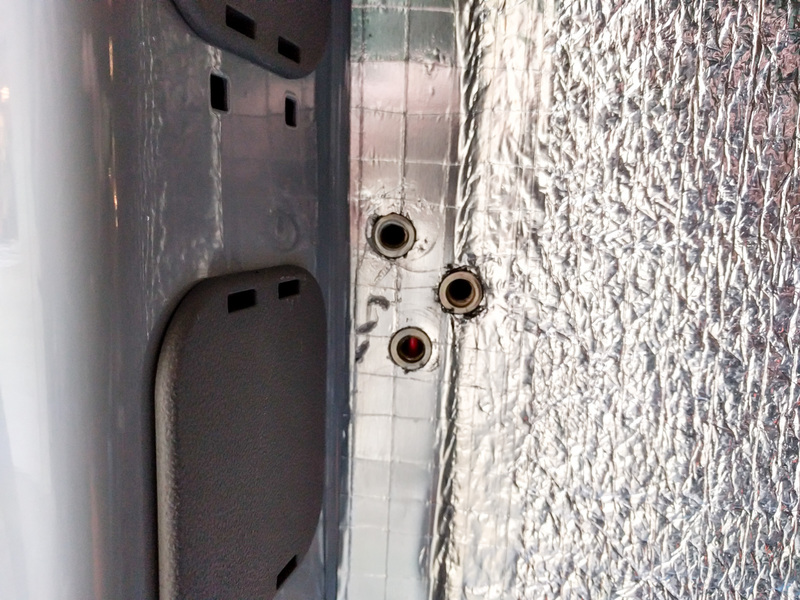 Last question, well… Maybe… How did you install rivnuts behind the wall panel to support the bed rails? Did you install the bed rail, then take all off, then drill holes where you measured in the wall panels and put all back up? Tyler, you’re right about the installation process. First, drill holes in the right place in the bed rail. Then, clamp it to the wall and mark/drill pilot holes. Then remove it, drill the holes in the walls and install rivnuts. Finally, put it all back together again. That’s the only way to be sure you get the holes in the correct places. Thanks for your excellent “how to” on the bed (I plan to use Overland’s bed setup) and other aspects of your Sprinter! One question – what is the name / style / color of the tweed fabric you use on your van walls? We used Charcoal Gray Silver fabric from Kovi. We bought it via Amazon. They will send you samples if you want, before you buy. Perfect Fit sell a cheaper type of interweave/automotive tweed that looks OK too. Good luck with the bed install! What length are your steal rails from Eric at Overlandsprinters? We ordered some, but I don’t think they are long enough. They are 70 inches and would need to be longer to get the vertical supports of the van. We have the 170 sprinter and as of now, the rail comes to the middle of one of the window cutouts. Hi Josh, we ordered the longer steel rails specifically for the 170. They are ~106″. In fact, we worked with Eric to specify the length, because he didn’t have access to a 170 wheelbase van. It sounds like you have shorter ones made for the 144″ wheelbase van. I don’t think that’s necessarily a problem though. So long as you bolt them on at the D pillar at the back and at the mid-point between the two “windows”, they should be plenty sturdy. The front panel will be cantilevered, but (although I’m not a structural engineer) I can’t see any issues with that. If you use the 70″ ones, you won’t have the rails getting in the way closer to the front of the van. For instance, our sink unit height is dictated by where the rail comes above it. Remember, even though the rails are 70″, you get around 5″ more space from there to the back doors. That’s why the rearmost bed panel has that cutout on either side. Thanks. I ended up talking with Eric and he swapped me for the longer ones. We are currently trying to figure out how to attach the panels to the rails. Are you happy with the j bolts and threaded knob design? How many did you use and any idea where to purchase them? I stopped by Fastenal and they had no idea what to use as far as j bolts. Again, thanks for your blog and responses. It had been a life saver. Cool. I’m glad Eric could help you out. He seems like a very decent guy! I’m happy with the J bolts. 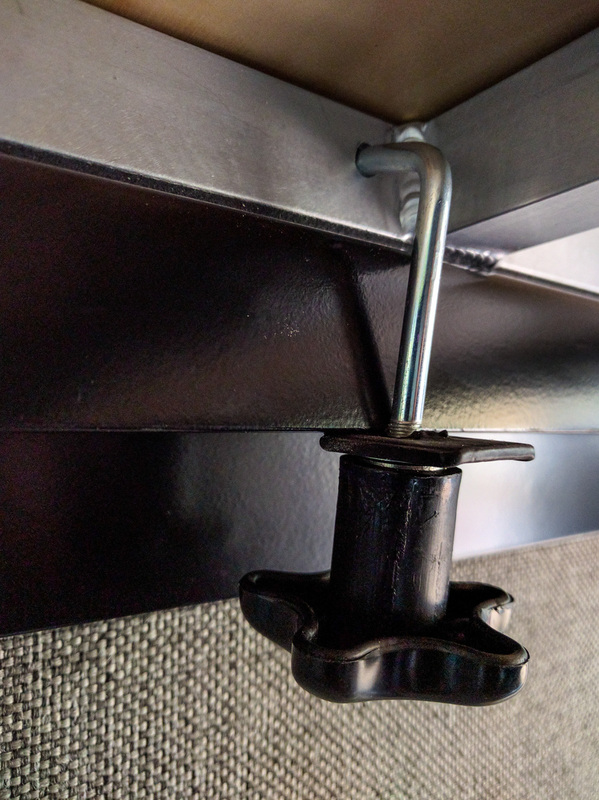 I bent them into a slightly sharper radius where they hook into the bed frame, and also changed the bed frame location so that the J bolts are on the crosspieces rather than the pieces that rest directly on the rails. I use one J bolt on each side for the two front panels, and two J bolts on each side for the rearmost panel because it has a tendency to tip over otherwise. I really can’t help you with the purchasing, because I found the ones I used in my spare parts bin and bent them to shape with a hammer and vice. Something like this might work, with knurled grip nuts something like these, but please check the dimensions before you buy – I just did a really quick search on amazon. You might have to modify whatever you buy to make it work well for the platform. I also wondered about using tool box tie downs. What depth Rivnuts did you use on you rail install? I see you said #8 thread but I’m trying to decide which size to order and they are asking for depth or length. I’m not sure I can really help you, Scott. I just used the rivnuts that came with the installation tool I bought. The rivnut measurements tend to be for depth of material. You’re using them in pretty thin steel, so order ones that are designed for a thin material range. What mounting height did you wind up using? 44″? We went with 42″. I can’t fully sit up in bed even at that height. However, 44″ would have fitted our big bikes just a little more easily with both wheels on. How are your rivnuts holding? My father in-law said plus its would be better, but I really don’t know what the difference is. Brandon, the rivnuts are holding up fine. There’s a lot of talk on the Sprinter forum about plusnuts versus rivnuts. The plusnuts have four slits along the body of the expanding piece, so there’s a larger amount of metal that gets folded out to the sides of the hole when you compress the fastener (makes the shape of a plus sign “+”). Plusnuts are also probably easier to install in slightly oversize holes. Ultimately for most uses in a Sprinter, I imagine either type of fastener would work just fine. I don’t think there’s much of a price difference between them. Also what size rivnuts did you use for the bed? Brandon, we used M8 rivnuts to attach the rails to the van walls. Do you see any issues using 1/4 birch ply for the Bed panels? Paul, my guess is that 1/4″ would be pretty springy. Even with a well constructed void-free birch ply it might flex too much. I don’t know for sure though. Maybe with enough fasteners holding it on to the aluminum frame you’d prevent it from bending so much. When you are lying on the bed your weight is spread over a larger area but when you climb up on to it or lean on your elbow on it there are some concentrated areas of pressure. My concern is that the 1/4″ panel wouldn’t have the stiffness to counteract that. If you try it please report back and let me know! Wondering how do you store your bed panel? Upright against the wall? I have a Decked drawer system in mine so I store them right behind the back seats but in front of the Decked system. Thanks!! Do you have any photos of them stored? No. Sorry. I just line them up on end in 3 rows then run a bungee cord around the panels works great. Stands up. I let even while off road. We typically take the bed panels out when we’re not using them. They do bungie up against the wall nicely standing vertically on one end. Hi, I am a new Sprinter owner and trying to set up a bed platform that is high enough so that we can store our bikes without taking off the front wheel (they have thru-axles). We want to mount it high and NOT weld a new horizontal flat steel support between pillars C and D. Is it ok to install a length of L-Track at each of the four pillars vertically and then use adjustable attachments to secure a rail? was then thinking of working with Overland for the panels. It sounds like you’re going to need to mount the bed at around 44-45″ above the floor. That’s possible, but it won’t give you much sit-up height. We made our platform *just* too low for our through-axle and Lefty fork freeride bikes and it’s really annoying, but it’s not the end of the world undoing the axle. Often we don’t have the bed platform pieces in the van at all and then it’s no issue at all. Inertiaman on the Sprinter forum did something similar to what you’re suggesting. He had to create some shims to fit behind the L-track at the pillars so that the L-track was properly vertical. I spoke to him about the bed platform he made and he said that although it works well, he’s not sure he’d go to the hassle of doing it again because he doesn’t move the bed up and down very much. If I recall, he has around 18″ of adjustability. So it’s possible to do what you’re asking, and it does give you some flexibility, but it may not be worthwhile. We didn’t weld anything in our van. We just bolted the bed rails to the C and D pillars (and the C-and-a-half pillars in the 170″ wheelbase van). That’s less bolts than you’d need for mounting the L-track. I’d definitely recommend Overland for their customer service. If you have a local fabricator who you trust to weld aluminum well, that might work out cheaper for three custom size panels. Hi there, wondering what kind of bolts/ washers you used with the M8 rivnuts and where you sourced it? How are they holding up? Also, did you use anything (such as Loctite Threadlocker) to keep it from loosening over time? Thank you! We used these M8 stainless socket cap hex bolts from Amazon, along with these stainless washers. Before you order, check that your M8 rivnuts are the same thread pitch as ours were (1.25). Most will be, but it would be a shame to order the wrong bolts. We didn’t use Loctite. In fact, we went the other way and used synthetic grease on the threads. There is a minor chance for galvanic corrosion between the zinc rivnuts and the stainless bolts. Stainless threads also gall quite easily. The grease is a way to minimize both those issues. We’ve had no problems with the bolts loosening over time. Gary, we didn’t deal with it at all. The rail bolts in to the wall just forward of where the D pillar pops out. The wall there has a slight angle to it but nothing serious. 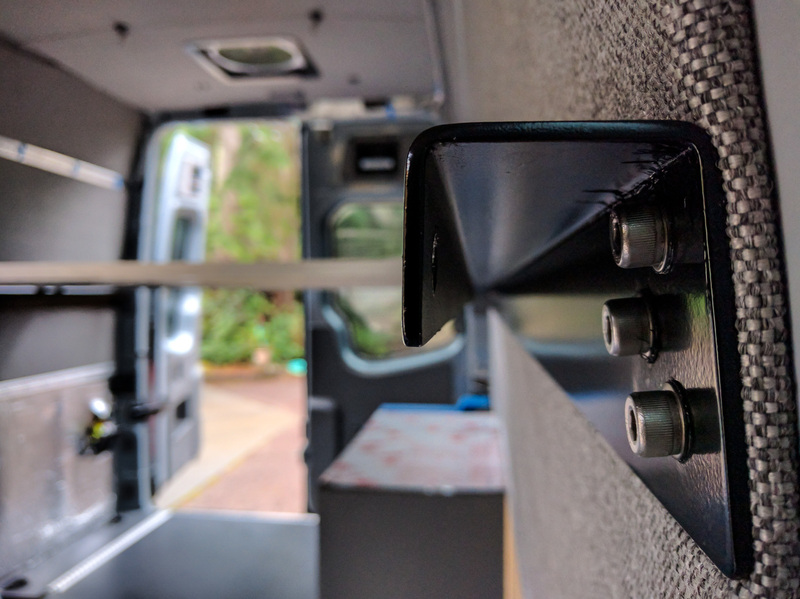 We have our wall panels (plywood, foam, fabric) sandwiched between the rail and the van bodywork, so that acts as a spacer/flange if any is needed. The rail is solid.